This morning's Sunrise Serenade was "I Got Rhythm" by Red Norvo and His Swing Sextet. Click on the song title to listen courtesy of Jazz On Line. In this encore from 2010, Looney Tunes joins the war effort as Porky Pig and Egbert the dog hunt down Missing Lynx, a Nutzy Spy. I especially like the visual pun on the song "Hallelujah, I'm A Bum." From the Internet Archive, the 1942 animated short, Confusions of a Nutzy Spy. This morning's Sunrise Serenade was "Wham (Re Bop Boom Bam)" by Andy Kirk and His Clouds of Joy. Click on the song title to listen courtesy of Jazz On Line. Today's Sunrise Serenade was "Lazy River" by the Mills Brothers. Click on the song title to listen courtesy of Jazz On Line. The playlist for the February 24, 2016 broadcast of the Swing Shift Shuffle has now been added to the playlist filing cabinet. Boing Boing posted a link to some scans from the 1931 Los Angeles University High School yearbook. As you can see, the students had a very interesting "Art Deco meets Alien" vibe. 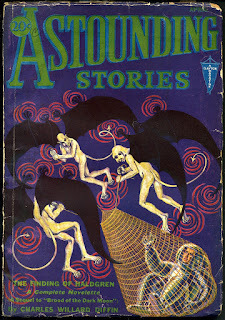 That fact might seem surprising, but consider that similar illustrations were not unusual in popular reading material of the era to which the students undoubtedly had access. See the example of an early 1930's Astounding Stories cover below, posted on The Golden Age. This morning's Sunrise Serenade was "Bugle Call Rag" by the Mills Brothers. Click on the song title to listen courtesy of Jazz On Line. The Red Hot Lindy Hop lesson and session continues at the Rumba Room this Friday night. Free beginner lesson at 7:00 p.m. Free admission before 7:00 and $5 thereafter. Lesson by Pip and Ruth with music by DJ Ruth. Today's Sunrise Serenade was "Jubilee" by Louis Armstrong. Click on the song title to listen courtesy of Jazz On Line. The MovieFanFare posting for This Week In Movie History had a few interesting points from the Swing Era. February 22, 1934: A Depression-weary American public flocks to Frank Capra’s screwball comedy It Happened One Night, starring Claudette Colbert and Clark Gable. February 27, 1934: A lawsuit against MGM’s Rasputin and the Empress results in the now-familiar “The events and characters in this film are fictional…” disclaimer. February 23, 1935: Cowboy Gene Autry saddles up in his first starring role, headlining the unusual sci-fi/western serial The Phantom Empire. February 27, 1935: It Happened One Night makes Academy Award history by taking Best Picture, Actor, Actress and Director. I thought the second item, about the "events and characters in this film are fictional . . ." disclaimer, particularly interesting. Those disclaimers are still in modern movies, but way at the end of the credits and in small print. In the 1930's, they were much more prominent, but then again, a lot of the credits were more prominent then. The disclaimer, however, apparently became the source of some humor, because you would see it as a gag in some cartoons from the era. This morning's Sunrise Serenade was "Along The Santa Fe Trail" by Glenn Miller and His Orchestra. Click on the song title to listen courtesy of Jazz On Line. Here is another great Saturday morning TV classic from my youth. A travelling magician gets cross-wise with our hero Bugs, and you can probably guess the rest. From the Internet Archive, here is the 1942 Warner Bros. short, Case Of The Missing Hare. Sunrise Serenade: Can Anyone Explain? This morning's Sunrise Serenade was "Can Anyone Explain?" by Ella Fitzgerald and Louis Armstrong. Click on the song title to listen courtesy of Jazz On Line. The playlist for the February 17, 2016 broadcast of the Swing Shift Shuffle has now been added to the playlist filing cabinet. Last Thursday, I posted about a comic book hero based on the Bible's story of Samson. Today, we have the other main character from that story, Delilah. 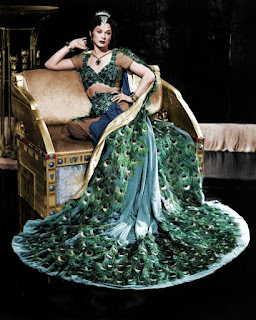 Specifically, here is Hedy Lamarr dressed as the leading lady from the 1949 film, Samson and Delilah, posted on Film Noir Photos. This morning's Sunrise Serenade was "Carnival In Venice" by Harry James and His Orchestra. Enjoy the video from YouTube. 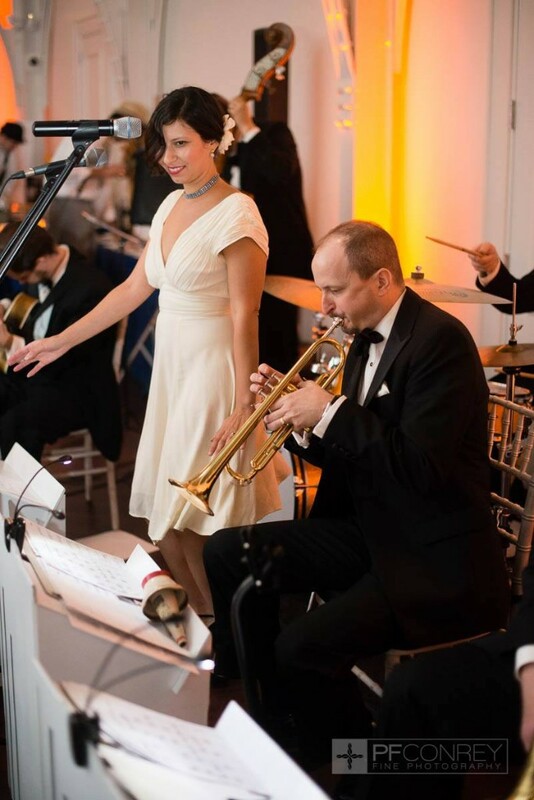 The Red Hot Lindy Hop lesson and session continues at the Rumba Room this Friday night with live music from the Jeremy Shrader Quartet. Free beginner lesson at 7:00 p.m. and $7 admission. Lesson by Todd and Josey. Dress like you are going out! Today's Sunrise Serenade was "All The Cats Join In" by Benny Goodman and His Orchestra. Click on the song title to listen courtesy of Jazz On Line. This morning's Sunrise Serenade was "Pray For The Lights To Go Out" by the Golden Gate Quartet. Enjoy the video from YouTube. I just started following a blog called The Swing Slate. In looking through some recent postings, I found this little gem that is perfect for a Friday afternoon cartoon post. "All The Cats Join In" was a tune written and performed by Benny Goodman and his Orchestra. Disney incorporated the tune into an animated short that was released in 1946 as part of an anthology film called Make Mine Music, consisting of ten unrelated musical shorts. Think Fantasia with popular music rather than classical. Featuring hep cats and kittens, bobby socks, a jalopy, a malt shop and a juke box, here is "All The Cats Join In." This morning's Sunrise Serenade was "So Long, Sarah Jane" by the Jimmy Dorsey Orchestra. Enjoy the video from YouTube. I have seen and posted about a wide variety of comic heroes, with an equally wide variety of origins, but as far as I can remember, this is the first time I found a hero (or rather two) based on the Bible. Like his Old Testament namesake, this Samson is super strong, and his power lies in his long hair. Unlike his biblical counterpart, however, this Samson can fly, and regrow his hair at will. 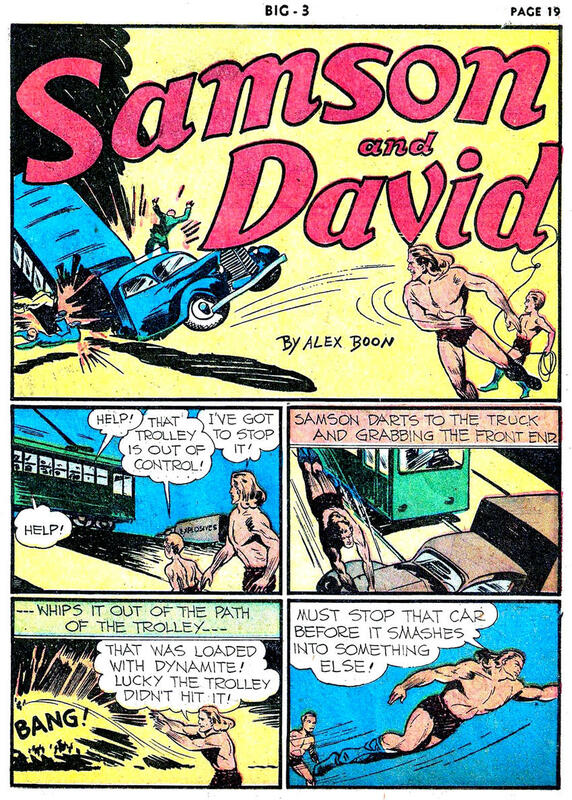 Posted on Pappy's Golden Age Comics Blogzine, here is a 1941 issue of Samson and David, fighting Nazis before the U.S. was even in the war. 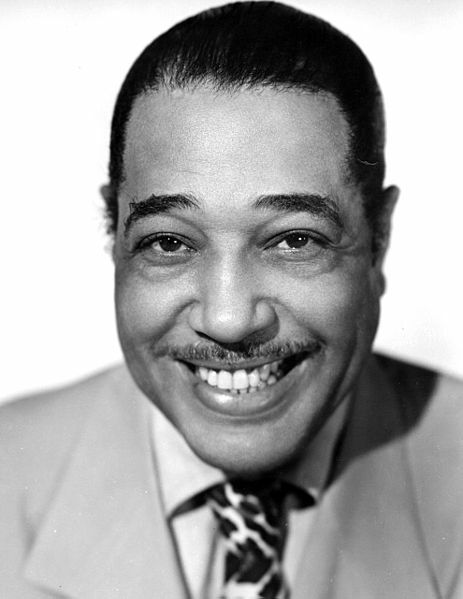 Today's Sunrise Serenade was "Jack The Bear" by Duke Ellington and His Orchestra. Click on the song title to listen courtesy of Jazz On Line. The playlist for the February 10, 2016 broadcast of the Swing Shift Shuffle has now been added to the playlist filing cabinet. The diminutive septet in the Brothers Grimm original tale of Snow White and the Seven Dwarfs did not have individual names. When Walt Disney released the animated version of the story in 1937, he corrected that omission with Bashful, Doc, Dopey, Grumpy, Happy, Sleepy and Sneezy. As MovieFanFare informed me, however, there were a bunch of other potential dwarf names that were rejected, including Awful, Burpy, Chesty, Dizzy, Hotsy, etc. The Red Hot Lindy Hop lesson and session continues at the Rumba Room this Friday night. Free beginner lesson at 7:00 p.m. Free admission before 7:00 and $5 thereafter. Lesson by Phil and Erin with music by DJ Phil. Live music next week with the Jeremy Shrader Quartet. Today's Sunrise Serenade, while perhaps not technically "Swing," could fall into the category of "Western Swing," and was definitely popular music in the late 1940's. It was "Pecos Bill" by Roy Rogers and the Sons of the Pioneers from the 1948 Disney film, Melody Time. Click on the song title to listen courtesy of Jazz On Line. 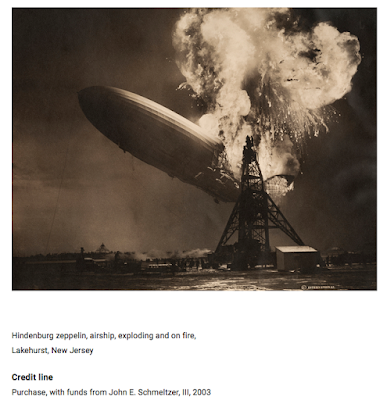 As this post on Dull Tool Dim Bulb points out, Sam Shere was the photographer who captured the iconic image of the Hindenburg exploding in Lakehurst, N.J. in 1937 (see below). 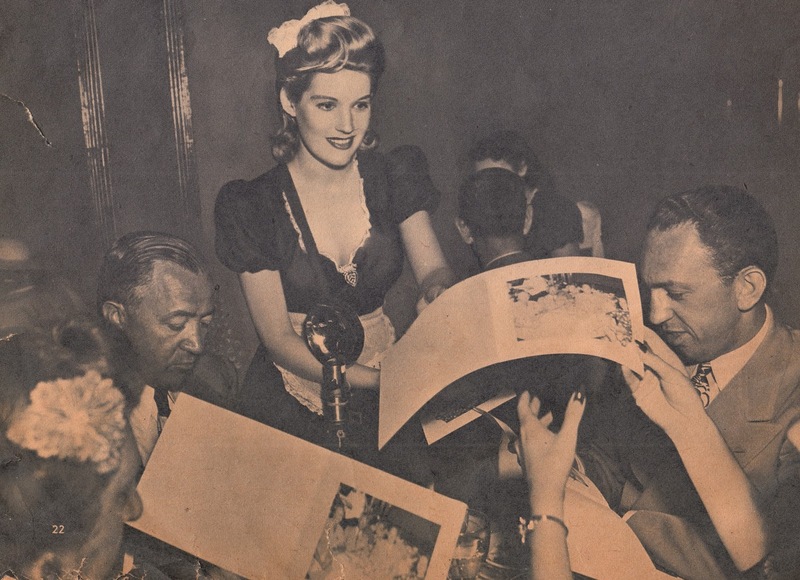 A few years later, he was taking pictures of other photographers, specifically, women photographers in nightclubs (above) who had replaced their male counterparts called to service in WW2. Here is a comic book version of one of my favorite characters, Simon Templar, a/k/a "The Saint." Played on film by George Sanders, Roger Moore and Val Kilmer; I recently heard a radio show version with Vincent Price in the title role. 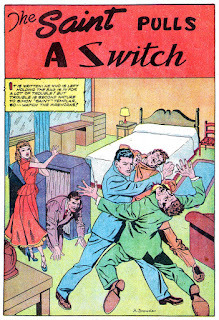 Pappy's Golden Age Comics Blogzine posted this comic from 1949. Today's Sunrise Serenade was "Sweet Heartache" by Valaida Snow. Click on the song title to listen courtesy of Jazz On Line. The playlist for the February 3, 2016 broadcast of the Swing Shift Shuffle has now been added to the playlist filing cabinet. 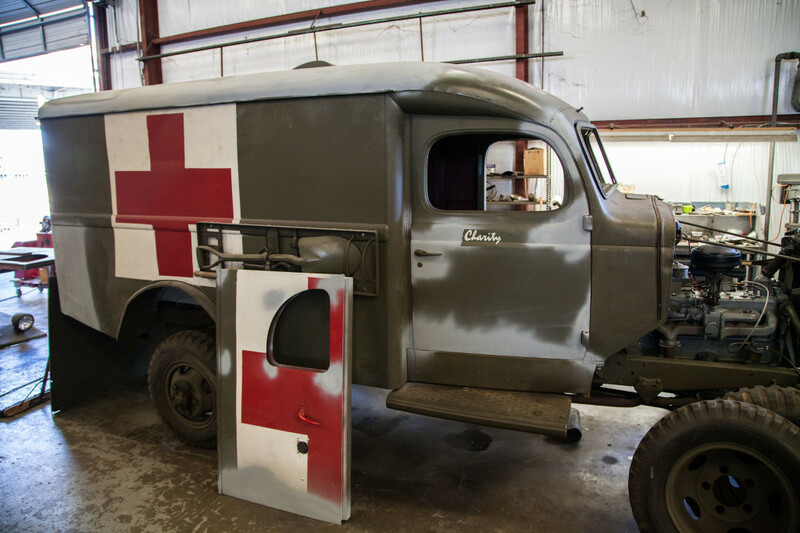 The National World War II Museum is engaged in a project to restore a WC-9 Field Ambulance named "Charity." 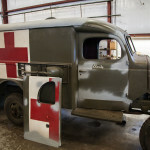 The goal is to make the vehicle resemble one that would have been used by Allied forces in Italy during 1943. Photographs of the ongoing restoration, and a sound clip of the engine running are available on the museum's blog post. This morning's Sunrise Serenade was "Daddy" by the Andrews Sisters. Click on the song title to listen courtesy of Jazz On Line. The Red Hot Lindy Hop lesson and session continues at the Rumba Room this Friday night. Free beginner lesson at 7:00 p.m. Free admission before 7:00 and $5 thereafter. Lesson by Jason and Monica with music by DJ Monica. Today's Sunrise Serenade was "Tutti Frutti" (no, not THAT "Tutti Frutti") by Slim Gaillard. Click on the song title to listen courtesy of Jazz On Line. The regular monthly preview of programming on Turner Classic Movies is up on The Hollywood Revue again. It is time for the annual 31 Days of Oscar, so every film this month will be an Oscar nominee or winner. Plus, every film will be connected to the movies before and after it by one star. Each movie features a star along with another star, and the other star is also in the movie that follows it, and so on and so on. So, by the time the 31 Days of Oscar, the final movie shown on March 2 will have a star in common with the 1st movie shown on February 1. This morning's Sunrise Serenade was "They're Either Too Young Or Too Old" by Jimmy Dorsey and His Orchestra with the late Kitty Kallen on vocals. Click on the song title to listen courtesy of Jazz On Line.